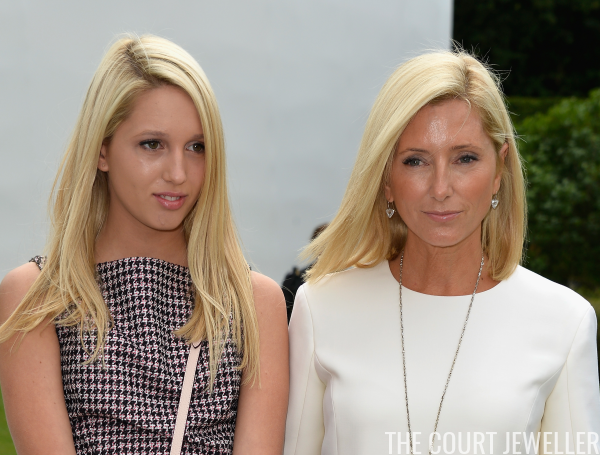 The Greek royal family may not have a country to rule anymore, but they still have an impressive jewel collection. 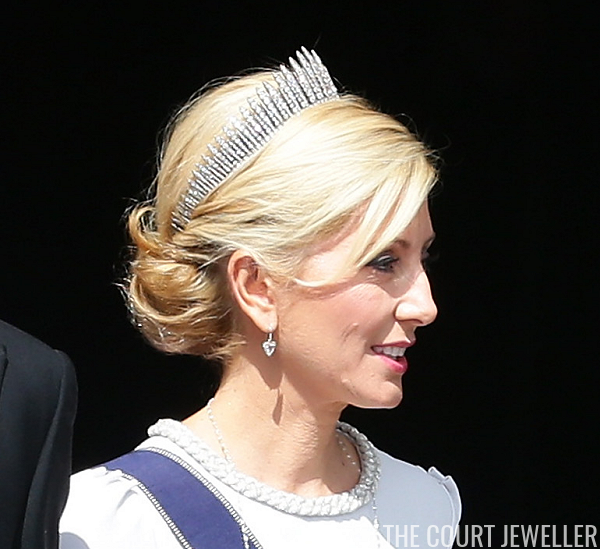 However, this diamond fringe tiara is a new addition to the Greek vaults, courtesy one of the more recent additions to the family, Crown Princess Marie-Chantal. 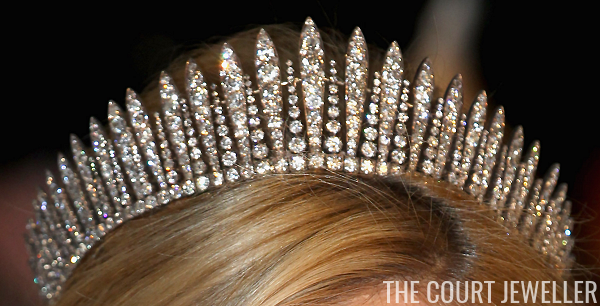 For years, there have been rumors that this tiara was a gift from Marie-Chantal’s wealthy family, the Millers. Her father, Robert Warren Miller, is one of the co-founders of the Duty Free Shops, those great purveyors of perfume, booze, and giant Toblerones, so there’s certainly enough money in the Miller coffers for a tiara or two. The tiara is a classic diamond fringe in the Russian style. The taller diamond spikes of the tiara are interspersed with shorter pieces that taper to a point, helping to fill out of the piece. The tiara is a large piece, nearly wrapping around the wearer's head, almost forming a circlet. I don't know whether this one can be worn as a necklace, but part of the frame is visible behind the fringe, sort of propping up the individual spikes, which makes me think a necklace conversion may indeed be possible. There are numerous similar diamond fringes still floating around in royal collections, because each Romanov grand duchess received one of these tiaras as a part of her bridal trousseau. That's a lot of fringes to be bequeathed and inherited! (And, unfortunately, sometimes to be sold and auctioned.) The specific provenance of Marie-Chantal's tiara, to my knowledge, has not been made public, but apparently it is an antique piece, not a new creation. 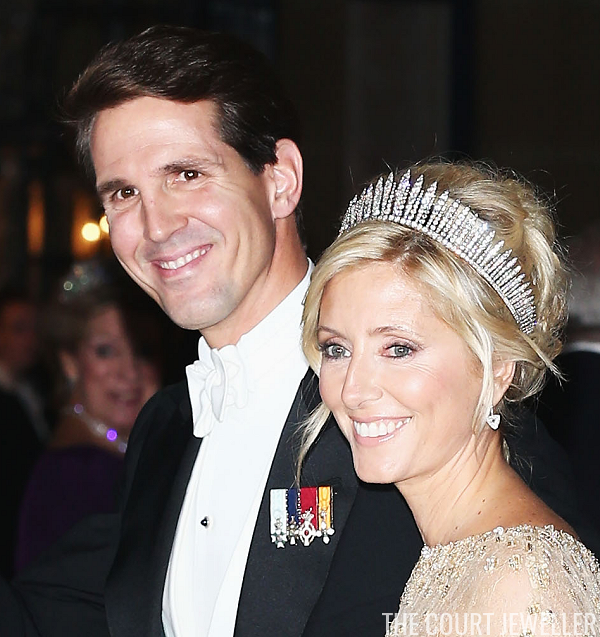 Marie-Chantal is the only person who has been photographed wearing this tiara, so most have guessed that the tiara was a gift earmarked specifically for her; however, others (including the writer Vincent Meylan) have suggested that the tiara was actually purchased at auction for Pavlos and Marie-Chantal’s only daughter, Princess Maria-Olympia, by her grandmother, Chantal Miller. Meylan has noted that the gift was bestowed on the baby princess as a christening gift. 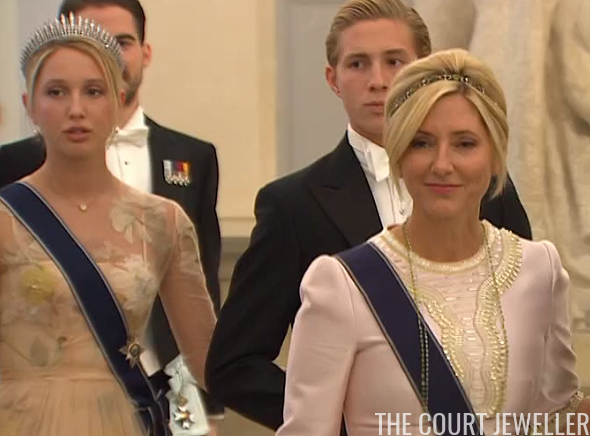 If that’s the case, Marie-Chantal is really just warming up this lovely fringe tiara for her daughter. As it's tradition in Scandinavian monarchies for princesses to begin wearing tiaras after their eighteenth birthdays -- and Maria-Olympia's great-aunt is Queen Margrethe II of Denmark -- perhaps we’ll get to see it on twenty-year-old Maria-Olympia herself in the near future?